No. 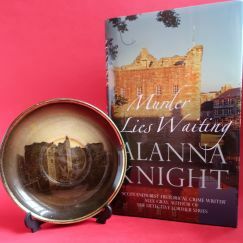 5 in the series – ‘Murder lies waiting’ by Alanna Knight meets a souvenir plate depicting Rothesay Castle. A hundred years ago, a visitor to Bute might take home a souvenir such as this Ridgways plate. The museum has a wonderful collection of Bute souvenirs including Mauchline Ware, pottery and jewellery. Alanna Knight’s latest novel is set in Bute in the early 20th Century. Rose McQuinn’s visit to a luxury Rothesay hotel turns into an investigation of a 20 year-old murder, which in turn unleashes a web of intrigue and sinister happenings. On Thursday 2nd of August Alanna will be in Bute Museum at a special pop-up event with Myra Duffy. Don’t miss it!